To add a link to either navigation bar, after selecting to use Structural Navigation, scroll down and locate the Structural Navigation: Editing and Sorting section of the page, and click the Global Navigation node (for the top navigation bar) or Current Navigation node (for the left navigation bar) in the Navigation Editing and Sorting box. Click the Add Link option in the menu. This selection opens a dialog where you can specify the link to be added (see Figure 5). FIGURE 5 Adding a link to a navigation bar. In the Title box, you can specify what text the link displays to the user. Also, you can either type in a link or browse to a page in the site by using the Browse button. You can also specify whether the link is opened in a new window when clicked. In sites where it is enabled, you can choose an audience for the link, specifying who should see the link. In a publishing site, you can add headings to both the top and left navigation bars. A heading in a publishing site can be a link or just text that can have other links under it. In a publishing site the heading doesn’t have to be a link. Instead, a heading can just be a container for links, without allowing users to click it in the navigation bar. To add a heading, simply click the Global Navigation node (for the top navigation bar) or Current Navigation node in the Navigation Editing and Sorting box, and then click the Add Heading button in the menu. The dialog that pops up is the same as the one for adding a link (refer to Figure 5), but unlike with adding a link, in this case you can keep the URL setting empty if you don’t want the heading to be a link. To edit a link or heading from either navigation bar, click the link or heading in the Navigation Editing and Sorting box, and then click the Edit button on the toolbar. 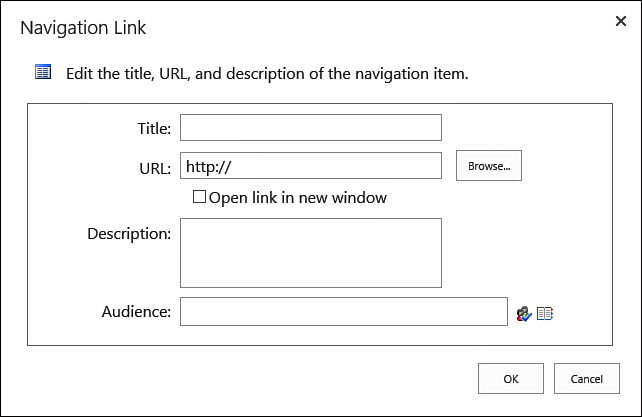 The dialog for the link’s setting opens, allowing you to specify how this link should behave (refer to Figure 5). To remove a link from either navigation bar, click the link in the Navigation Editing and Sorting box, and then click the Delete button on the toolbar. To select the heading for a link in a publishing site, move the link up or down in the Navigation Editing and Sorting box until it is under the heading you want. Select the link, and then use the Move Up and Move Down buttons to move the link in or out of headings. You can have a link exist in the root (not under a heading). Simply move the link to be under either Current Navigation or Global Navigation.